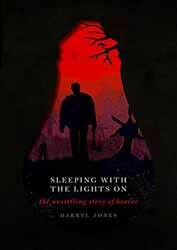 The Oxford University Press publishes Sleeping With the Lights On: The Unsettling Story of Horror, by Darryl Jones – Professor of English and Dean of the Faculty of Arts, Humanities and Social Sciences at Trinity College Dublin, where he teaches nineteenth century literature and popular fiction. His other books include, the Oxford World’s Classics M.R. James's Collected Ghost Stories, and the previously reviewed Arthur Conan Doyle’s Gothic Tales, and Horror Stories: Classic Tales from Hoffmann to Hodgson. Unlike the latter two releases, this one is not simply edited by Jones but an exploration of the horror phenomenon in all its forms. And therein lies the rub. Any non-fiction text or auto/biography hinges decisively on how the information is put across. For example, an autobiography might describe I went there and I did this, which is dull compared with a series of interesting and humorous anecdotes which place you squarely in the action. Similarly, here I feel I’m being dictated to. Jones is a lecturer, so I suppose that’s only to be expected. However, rather than mixing it up and dealing with horror as a whole, this book pigeonholes everything. We get separate sections on Monsters, the Occult and the Supernatural, Horror and the Body, Horror and the Mind, Science and horror, and Horror Since the Millennium. I think that many devotees of the fiction horror genre will know much of this information already. Those parts which might otherwise come as a revelation are written in such a stiff manner that you might subconsciously put up a mental wall and not take it in anyway. Of course, there are some writers (Kim Newman being one of them) who I feel are much more interesting in person than in print – Darryl Jones could be one of them. I have inferred that this is a case of design over substance, and the design is very nice. It’s a pocket-size hardback book. Much of the front cover is cut out in the shape of a light bulb to tie-in with the title. Through the cut-out you can see a silhouetted zombie scene in black and red. The page are very nice quality, too. With such a nice presentation, I feel this book is a missed opportunity to make it a more saleable release.